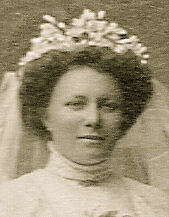 On 1 July 1903, William, aged 27, married Edith May Haines, aged 22, daughter of Thomas Haines and Elizabeth Baird, in Methodist Church in Hamilton, South Australia . Mr. William Henry Siviour, who died on August 10, was the eldest son of the late Mr. and Mrs. R. H. Siviour, of Cummins, and was born at Red Hill 65 years ago. In 1902 Mr. Siviour took up land near Cummins, and lived there until he retired in 1927. 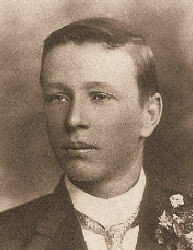 He was a life member of the Cummins Agricultural Society, and was secretary and then president for many years. He was also a member of the Port Lincoln Masonic Lodge. Gladys Doreen Siviour was born on 22 December 1904 in Port Lincoln, South Australia , daughter of William Henry Siviour and Edith May Haines. On 12 April 1928, Gladys, aged 23, married Clifton Eric Young, aged 26, son of Edwin Young and Mary Sherrah, in Methodist Church in Parkside, South Australia . Gladys had several notices in the "The Advertiser"
On March 16 at Austral Nursing Home aged 86 years. Eldest daughter of the late William and Edith Siviour. Loved sister of Angas and sister in law of Edith. Loved aunty of Bill, Yvonne, Barbara, Lorraine, Jennifer and Wendy. May she rest in peace. Loved eldest daughter of William and Edith Siviour dearly loved sister of Vi, Arthur, Stella, Angas, Mabel (deceased) and Melva. Loved sister of Vi and sister in law of the late D'arc Wurst. Fond aunt of Joanne and Arch Dickson, Peter and Kay and families. Dearly loved sister of Melva sister in law of the late Norman Pepall, dear aunty of Gary, Pam, Dean and Jean and families. Dearly loved sister of Stella sister in law of the late Gordon Brace, dear aunty of Angela and the late Kevin Shaw and families. Violet May Siviour was born on 6 October 1906 in Port Lincoln, South Australia , daughter of William Henry Siviour and Edith May Haines. On 18 October 1930, Violet, aged 24, married D'Arcy Harold Wurst, aged 24, son of Johann Gustav Wurst and Annie May Lieschke, in Scots Church, North Terrace in Adelaide, South Australia . Robert William Haines was born on 30 May 1883 in Kapunda, South Australia , son of Thomas Haines and Elizabeth Baird. On 11 October 1907 he Wife, Maggie, died. Letitia Marian Haines was born on 19 July 1885 in near Hamilton, South Australia , daughter of Thomas Haines and Elizabeth Baird. Letitia was known as Letty by her family and friends. She died on Sunday, 21 June 1964, aged 78 years, 11 months and 2 days, in South Australia . Mark Spencer Flower Haines was born on 15 November 1886 in Mundoora, South Australia , son of Thomas Haines and Elizabeth Baird. George Lionel Haines was born on 5 September 1888 in Mundoora, South Australia , son of Thomas Haines and Elizabeth Baird. James Stanley Haines was born on 31 May 1890 in Mundoora, South Australia , son of Thomas Haines and Elizabeth Baird. Herbert John Hanlan Haines was born on 11 October 1891 in Mundoora, South Australia , son of Thomas Haines and Elizabeth Baird. Herbert began military service on 14 June 1915 in Keswick, South Australia , when he enlisted in the A.I.F. His service number was 3011. On 4th October 1915 he was appointed as a Lance Corporal. On 13th November he landed at Gallipoli, towards the end of the campaign, but was only there until the 24th October, when he was sent to the hospital in Malta for treatment of venereal disease. He was there for 69 days. He rejoined his unit in February 1916 and they were sent to France. He was promoted to Corporal in November 1916. On 11th April 1917 he was reported to be "Missing In Action". However, it was found he had been captured at Reincourt, during the first day of the offensive to take Bullecourt. He was one of 1,170 men taken prisoner, the largest number captured in a single engagement in WW1. He was interred in the Limburg POW camp, in Germany. Alison Maud Haines was born on 16 March 1893 in near Hamilton, South Australia , daughter of Thomas Haines and Elizabeth Baird.